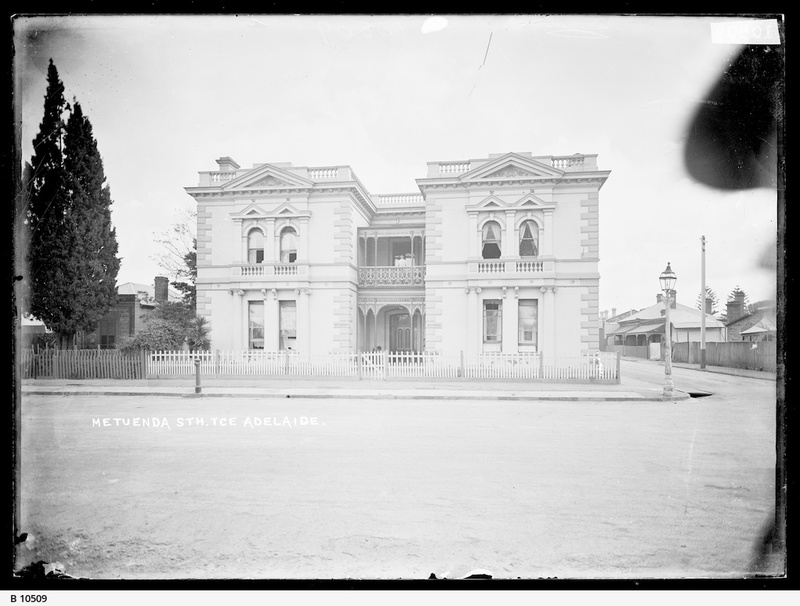 South Terrace east, west corner of Louisa Street, showing "Metuenda", a private residence. Frontage: 19 1/2 yards. The large two storey double winged house has a recessed front door and overhead balcony. Across the roofs of all three parts of the house stands a balustraded parapet. The house stands on a prominent site on the corner of Louisa Street and South Terrace. The owner was Friedrich Christian Wilhelm Bruggemann who arrived in Port Adelaide from Bremen, Germany in 1856. He was aged twenty and his occupation was a saddler. The house was for some time used as a hospital or 'Patients' Home'.